Imagine walking into a job interview or your first day at work wearing a $10 watch you bought at Walmart a few years back. You probably won’t give off the professional look that you’re going for. My younger brother was caught in this exact situation. He had recently graduated college and secured his first professional job at a national insurance company. He’s not the stylish sort, and it’s rather obvious from his cheap digital watch. Although his sense of style oftentimes misses the mark, he did quickly realize that his watch didn’t compare to the watches worn by his colleagues. After just a few days, he began leaving his digital watch at home. Investing in your first professional watch is something that every man needs to do. Wristwatches are one of the few accessories available to men, and pairing a watch with your outfit can take you to the next level (both professionally and personally). Why Do You Need to Wear a Watch? Wearing a quality watch makes a good first impression, and it tells your employer that you’re a professional who can be taken seriously. Your colleagues (especially if they’re watch guys) will notice your watch, and they’ll immediately access your character and personality based on the watch that you wear. It may sound pretentious, but wearing a cheap watch will negatively affect their impression of you. Some men solve this problem by avoiding watches entirely. This solution is becoming more popular now that everyone has a smartphone in their back pocket that can do much more than tell time. However, relying entirely on your smartphone can pose additional problems. There are quite a few situations (both in and out of the office) that you cannot pull out your phone to check the time. For instance, checking your phone in an interview or a meeting is rude and disruptive. To you it may seem harmless, but the person you’re with may perceive that you’re bored and inattentive. Wearing a watch allows you to discreetly check the time without anyone noticing. Unless you’ve been living under a rock, you’ve probably heard that saying before. This saying doesn’t just apply to your wardrobe, it also applies to your watch. The watch you wear can tell your employer about your personality and your maturity. Wearing a $10 digital watch won’t say much about your maturity, but a high-quality mechanical or quartz watch will speak for itself. When Should You Invest in a Professional Watch? Ideally you would invest in a professional watch when you start looking for your first full-time job. However, we understand that money can be tight right out of college and investing in a quality watch may not be a high priority. If you cannot buy a watch immediately after graduation, we recommend buying it soon after finding a job. After a few years at your company and a little more flexibility in your budget, it might be good to revisit the watch world and upgrade your watch. Although it may seem odd, investing in a watch is an investment in your personal brand, and your colleagues and employer will take notice. Building your personal brand will help you get one step closer to that promotion you’ve had your eye on. As cool as the new Apple Smartwatch is or as useful as the new G-Shock tool watch is, those are not the watches that you should invest in for your first professional watch. Instead, you should choose a classic watch that won’t go out of style and can be worn with both business casual and business formal outfits. 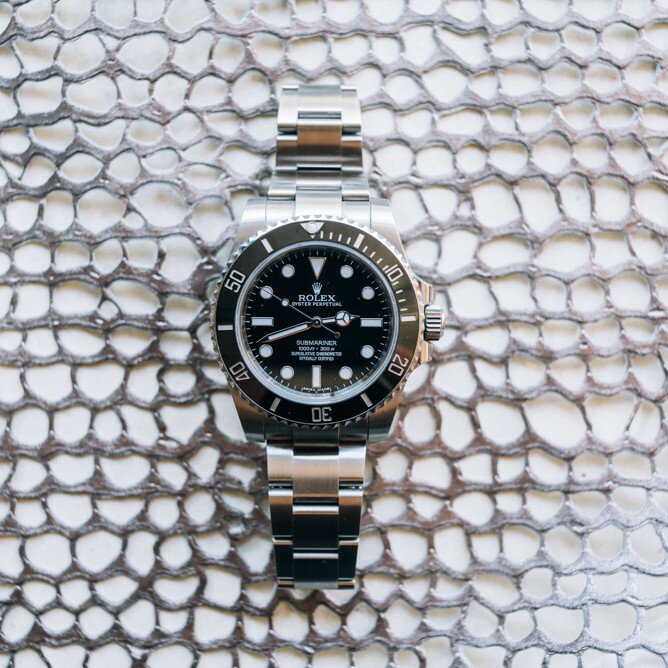 Stainless steel watches are some of the most popular and least expensive watches, and you can choose between a stainless steel bracelet or a leather strap. Avoid rubber straps or nylon straps, especially when your office dress code is business formal. A clean, uncluttered dial is often the best option for a dress watch. This ensures that the design and style of the watch are at the forefront, instead of the gadgets and features. Although useful and technologically advanced, tool watches and smartwatches are best left for weekends. It is important to remember that your first professional watch does not have to break the bank. There are quite a few brands that offer classic watches for under $1,000. We recommend checking out Seiko, Citizen, Tissot, Baume & Mercier, or Bulova for an affordable watch that is well made. If your budget is under $5,000, then visit IWC, Tudor, or Frederique Constant. If you have a more flexible budget, you can’t go wrong with a Rolex or an Omega.